Tack cure for no more than 5 seconds, it is difficult to remove excess once it has set. Make sure to follow the instructions for use for the specific application. Take a follow-up radiograph to check that all excess cement is removed. Separate components into what normally gets used versus what rarely gets used. 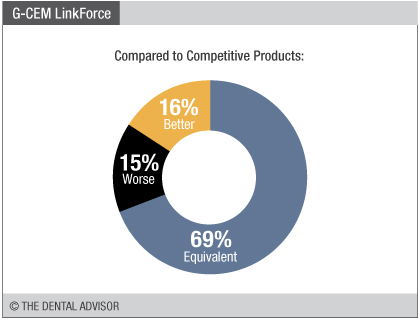 G-CEM LinkForce was evaluated by 26 consultants. Complete and versatile system for multiple applications. Good viscosity and low film thickness. Easy to use and easy clean-up. Excellent laminated instructions for use. 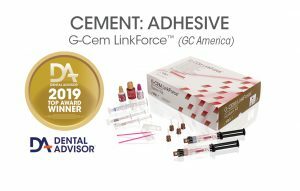 G-CEM LinkForce is a dual-cured, radiopaque, universal adhesive resin cement system. The three main components in the kit are the G-Multi PRIMER, G-Premio BOND and the G-CEM LinkForce universal cement. The MDP and MDTP-based G-Multi PRIMER improves bond strength and is applied to the intaglio surface after the restoration has been prepared with hydrofluoric acid (for glass and hybrid ceramics) or sandblasted (all restoratives except glass ceramics), then dried. G-Premio BOND (also MDTP-based) is applied to the tooth surface after self-etching, selective etching or total etching. Light-curing of the bonding agent takes 10 seconds. If self-curing is required, G-Premio BOND is mixed with an equal quantity of G-Premio BOND DCA, applied and then air-dried for 5 seconds after waiting 20 seconds. 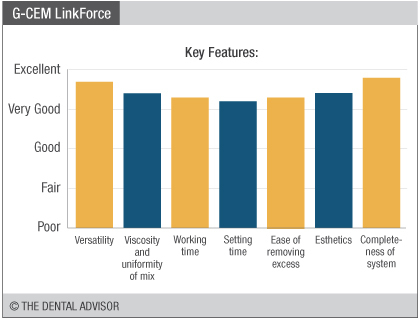 G-CEM LinkForce adhesive cement, after mixing, has a working time of 3 minutes at normal room temperature. Tack-curing takes 1 to 2 seconds for easy clean-up prior to final cure. Light-curing the cement takes 20 seconds for each surface or margin. Alternatively, the cement can be left to self-cure for 4 minutes. The G-CEM LinkForce kit contains three 5 mL automix syringes, one each of three esthetic shades (A2, translucent and opaque), together with 45 automix tips. The kit also includes a 1.2 mL syringe of try-in paste in each of the three shades. Additional components include a 3.6 mL syringe of etchant, 5 mL bottle of G-Premio BOND, 5 mL bottle of G-Multi PRIMER, and 3 ml bottle of G-Premio BOND DCA. 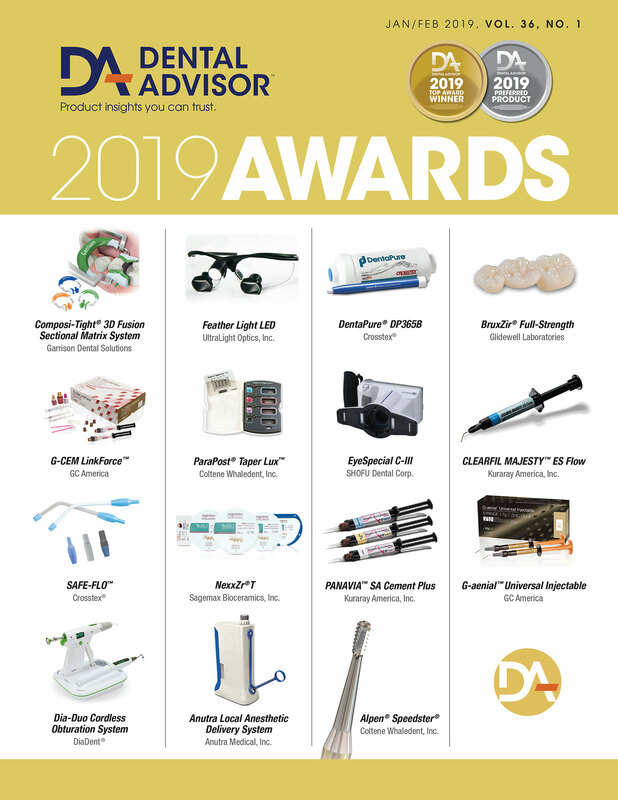 The remaining contents are automix endo mixing tips, 25 metal dispensing tips for the etchant and try-in paste, 50 disposable applicators, 20 disposable dispensing dishes, and a laminated sheet with directions for use. Refill syringes are available for the primer, bonding agent, try-in paste, and adhesive cement shades. Cementation of all CAD/CAM blocks. 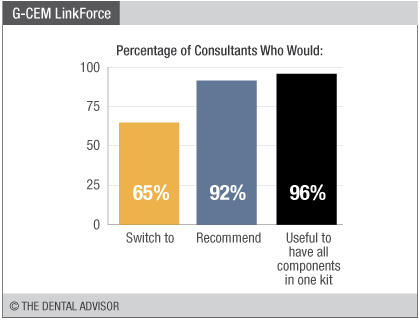 G-CEM LinkForce is a complete system kit. It can be used for the cementation of all restorative materials, including ceramics and hybrid ceramics, lithium disilicate, zirconia, precious metal and porcelain-fused-to-metal, and for glass fiber posts. The system includes G-Premio Bond DCA, a dual-cure activator that allows the light-cured primer to be used in areas where light curing is not possible.